The Sequel to INSANITY is AVAILABLE NOW! 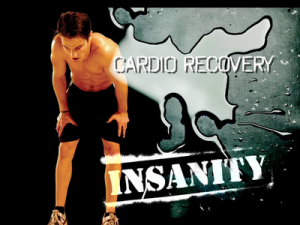 Cardio Recovery is the third of ten workouts included in the INSANITY with Shaun T. 60-day total body conditioning fitness program. After the Plyometric Cardio Circuit and Cardio Power & Resistance workouts, Cardio Recovery is a welcomed change of pace. This is a relatively light workout compared to the first two. It’s a solid routine and you will sweat, but the easier approach will help your muscles recover before the next DVD. Cardio Recovery includes some light jogging, a good combination of squats and “deep muscle” lunges, followed by balance and stretching Yoga exercises. Overall, this workout is challenging but definitely a good mental and physical recovery day. The majority of the workout will be very familiar to P90X graduates who remember X Stretch and Yoga X.